Those of you who regularly read GEB know I'm very much into flying-related Google Earth use. I was just contacted by a guy named Leif who has recently released an excellent Google Maps mashup called Flyagogo.net designed for pilots. Even if you aren't a pilot you might enjoy playing around with it a bit. The mashup shows sectional/terminal maps (pilot visual guide maps), infared and visual satellite weather views, Google Maps' satellite/aerial photos, and NEXRAD radar weather. The interface even allows you to simply put in a flight route (e.g. "ATL-BKV-MIA"). Right now, his Google Earth integration is limited to letting you fly to an airport view. For example, if you enter "Apt:MIA" you will see the small GE logo icon (like I use here at this site) next to the name "Miami International" and if you click on it you will fly to the airport in Google Earth. Lief has offered to take suggestions for better integration with GE. So, you can be sure he'll get a bunch of ideas from GEB's author. Obvious features will be to add a KML output when you enter a flight route and show the path in GE. 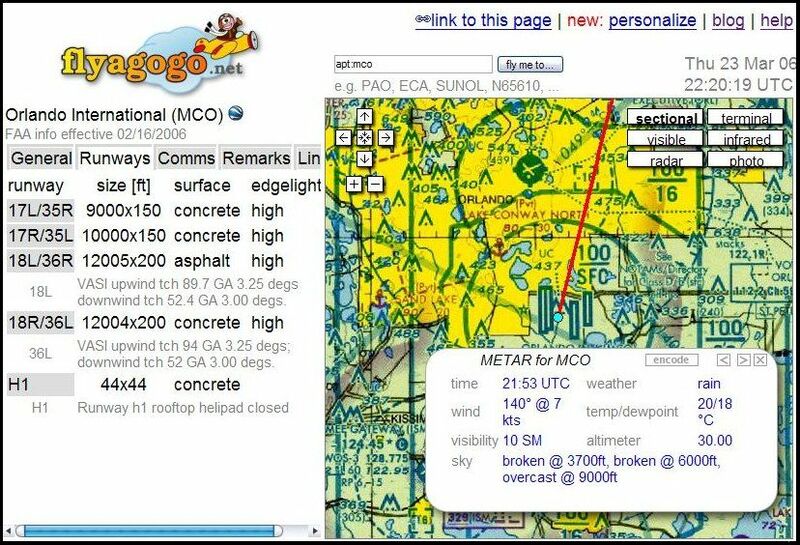 Adding placemarks which allow you to bring up the METAR (weather) info, airport information, and even putting the weather data as overlays would be obvious next steps. If you are a pilot, definitely give Flyagogo a try!